Navigator supports two put away strategies. For companies receiving pallets of stock (both mixed and single item type), Navigator includes simple transactions to transfer the received pallet from inbound staging area to a free bulk storage location in the racking. 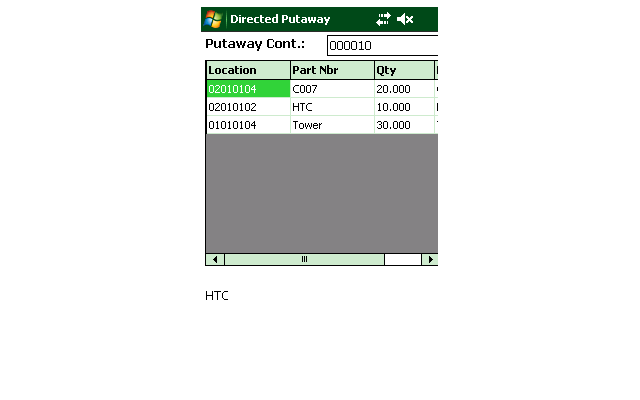 Navigator allows the putaway operator to scan the pallet they are taking, and the location into which stock will be transferred. Navigator's directed putaway module ensures that users move stock from a pallet or staging location into the correct picking location. The operator can scan a lot number label to see a sequenced list of instructions for emptying the pallet. Navigator ensures that stock is only placed into the correct bin, posting stock changes to the inventory module and even completing any pending replenishment task for the bin. Reduce put away time by sorting instructions on mixed pallets. Full pallets can be easily transferred into bulk locations. Direct staff to put stock into pick locations from a mixed pallet.